Most of you moms (and dads) in Calgary don't speak French; but you want your children to be in French Immersion. So how do you help them with their homework?? You get a warm, friendly French tutor to help you. Her name is Nathalie. 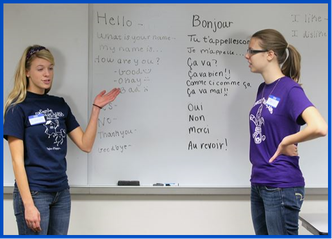 Students enjoy French Immersion classes where their core subjects are in French. However, at home mom and dad speak English (or Mandarin, or Russian, or Japanese, or Spanish) ... but not French!! Again, a French tutor for one hour a week could prove very useful and it might not be as expensive as you think. Can you think of a better resource for your child to help him/her succeed? Or, perhaps your teen finds high school French classes difficult. We can help them with their homework and with exam preparation. Having a tutor helping your child to do his/her homework will take the pressure off of you. And child's marks will improve; and that takes pressure off your children. It's a win-win for everyone!! Over the years, we've noticed that the students with the most difficulties are those in Late French Immersion. And being in Late French Immersion, can really stress a child. We want to help. We love seeing children learn French. What a thrill to hear each say, "Oh, now I get it." As a private French tutor, we try to come along side each of them and fill in those holes in their knowledge. Tobian loves to read books in his French class. In France, Nathalie taught for 12 years with le département d'éducation (Ministry of Education). Then she taught for six years at a private French school here in Calgary. She is a real teacher -- not just a tutor. It is one thing to be good at Mathematics, but quite another to study it in a second language, such as French.